A new report from the Pew Research Center says the candidates may be right. 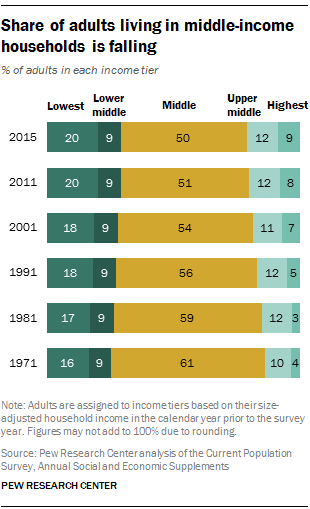 For the first time since at least the 1960s, the majority of Americans aren’t in the middle class. In 2015, just under 50 percent of American adults lived in middle-income households. (The chart above rounds the number to 50 percent.) That’s down from 54 percent in 2001 and 61 percent in 1971, the earliest year Pew looked at. Meanwhile, the share of income going to middle-income households has also fallen, from 62 percent in 1971 to 43 percent last year. Moreover, as I wrote last year, it’s important to remember that typical American household has changed dramatically over the past three decades. The U.S. population has grown older, on average, which makes a big difference to median income because retirees often have little income and live off savings. And it has become more diverse; in particular, the rapid rise in the number of immigrants in the late 20th century pushed down median incomes because immigrants, on average, make less money. 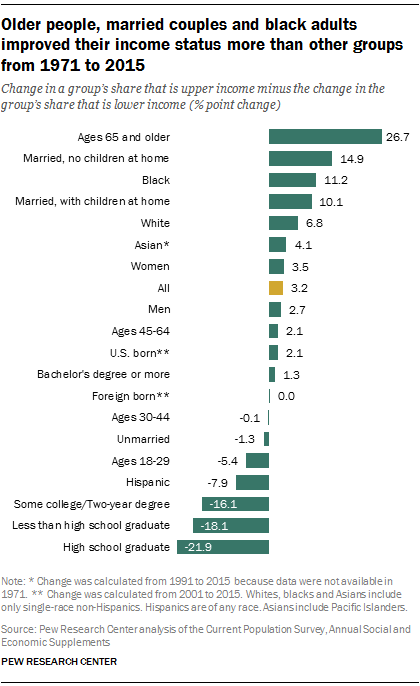 Notably, according to Pew, black, white and Asian households have all seen a net increase in their income status since 1971, while Hispanics, who make up a large share of new immigrants, have seen a net decrease. All these trends — an aging workforce, income polarization, immigration and racial disparities — are important issues with major economic and social implications. So is the decade-and-a-half-long stagnation of middle-class incomes. But the full picture is more nuanced than the “death of the middle class” narrative so often heard on the campaign trail. Income levels are adjusted for the number of people in a household. If there are more people living together, it takes more money to achieve the same standard of living.